April 20-22, 2012 – After less than a week from playing in the 17U Provincials, Durham Attack’s 17U Girls’ Team were back at Rim Park in Waterloo, competing in the 18U Provincials. Still pumped from bringing home the GOLD medal the previous weekend, Attack went into the first day of the tournament raring to go. Attack played some very competitive teams in Pool Play going up first against Burlington Blaze and winning that match (25-20, 20-25, 15-10). They also won the next match against Predators Black (25-18, 25-20). With a loss to Defensa in the third match (25-22, 23-25, 6-15), Attack finished second in their pool. On the second day of the tournament, the Power Pool brought Durham Attack up against some tougher teams. Attack lost against the Predators Purple 18U team – 22-25 and 10-25. They then took the Toronto Diamonds to three sets, but lost that match with scores of 30-32, 25-23, and 10-15. The last team of the day was Leaside’s 18U team. The stress of playing back-to-back weekends had finally caught up with Attack, and they were not able to hang on, losing both sets 23-25 and 17-25. This gave Attack a last place finish in the Power Pool. Day three was a different story. Attack was given a chance to redeem themselves in the pre-quarters. They proved that they were still a team to contend with when they beat Scarborough Nemisis 25-13 and 25-14. This earned Attack a spot in the Quarter Finals up against Ottawa Mavericks. After losing the first set 18-25, it didn’t look very hopeful for Semis, but Attack brought out their best and beat the Mavs 25-23. The momentum continued and Attack won the tie-breaking set 15-10. Attack had made it to the Semi Finals and, once again, was to face Leaside 18U. Attack lost the first set 23-25, but secured a win in the second set 25-23. Attack fought hard in the tie-breaker, but lost 11-15. The Bronze Medal match was against Defensa (yes, again). Attack again took them to three games, but lost the match with scores of 15-25, 25-20, and 11-15. Still a fourth place finish in this older division is a great showing and a huge accomplishment for Durham Attack’s 17U Girls’ team. They should be proud of themselves. Congratulations to Durham Attack’s 17U Girls’ Team: Anna Aguayo, Jaime Fryer, Ashley Hart, Julie Longman, Olivia Michaud, Nicole Mironov, Rachel Poole, Layton Risto, Callan Rolfe-Hughes, Kristine Yan, Michelle Yu and coaches Kevin Hellyer and Mike Slean. 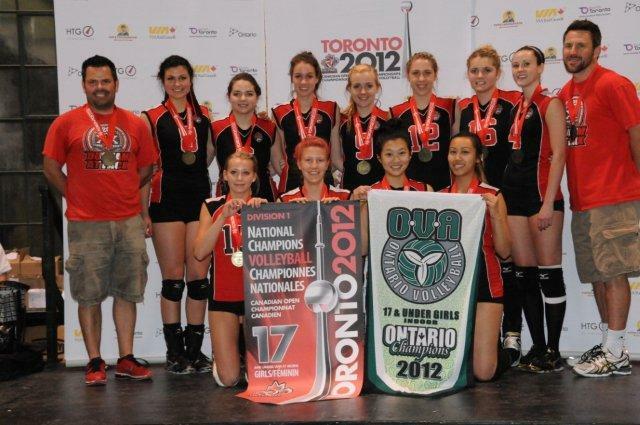 April 13-15, 2012 – The hard work and determination of the Durham Attack 17U Girls’ Team this season culminated in a GOLD medal win at Provincials at RIM Park in Waterloo, Ontario. The success of this team was evident from the start when they brought home their first medal on November 26. After eight tournaments in both the 17U and 18U divisions, Durham Attack had acquired two gold, three silver, and two bronze medals. Attack were determined to bring home another. The three-day tournament started early Friday morning against Durham Attack’s 16U team. Not prepared for this younger team’s great defense, the 17U Attack team fell short a few points losing 22-25. The 17U team came back to win the next two sets, however, 25-13 and 15-3. Durham Attack 17U Girls team won the next two matches in pool play against Eclipse West (25-21 and 25-16) and DRVC (25-10, 24-26, and 15-7), placing them first in their pool. Day two brought Attack up against some tougher teams forcing them into tie-breaking matches, but Attack won all matches with scores as follows: Preds Purple 22-25, 25-6, 15-13; Lakeside 25-17, 24-26, 15-9; and Forest City 25-18, 17-25, 15-4. Another great day for Attack and again first place in their pool. The success of the first two days earned Attack a spot in the Quarter Finals. They had no problem against Ottawa’s Black Jacks, winning both sets 25-13 and 25-10. Semi Finals brought Durham Attack up against Forest City once again, Attack’s biggest rivals. Two strong sets with scores of 25-10 and 25-19 paved the way for Attack into the Gold medal match. Lakeside also made it through their semis as well so Attack, once again had to battle it out with them for the gold medal. 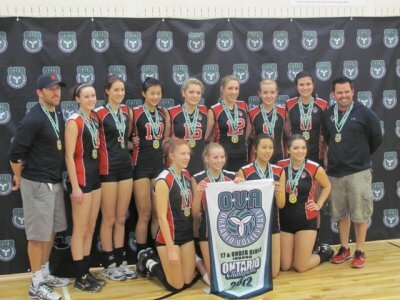 After the best volleyball Attack had played this weekend, they beat Lakeside after three sets – 26-28, 25-21, and 15-11 winning GOLD and BEST in ONTARIO! Congratulations to Durham Attack’s 17U Girls’ Team: Anna Aguayo, Jaime Fryer, Ashley Hart, Julie Longman, Olivia Michaud, Nicole Mironov, Rachel Poole, Layton Risto, Callan Rolfe-Hughes, Kristine Yan, and Michelle Yu. Also to their Coaches Kevin Hellyer and Mike Slean whose dedication and commitment to this team helped earned Attack this provincial title. On March 24, the Durham Attack 17U Girls’ Team was in London, Ontario to play in their last regular 18U volleyball tournament before Provincials. They had already been successful in winning two silver medals in three of the tournaments in this older age group, however, the Bugarski Cup tournament was going to be their most difficult. The top 9 teams in Ontario had earned their spot into this premier division and were determined to improve their ranking for Provincials. The Durham Attack girls faced their first challenge in Pool Play with their first match against the Toronto Diamonds. Attack had a strong start and had no trouble beating Diamonds in the first set, winning 25-16. The second set proved somewhat more difficult and D.A. lost 23-25. Attack fought hard in the tie-breaking game, but was not able to secure the win, losing 14-16. Next, Durham Attack had the 18U Waterloo Predators to contend with. This team has been strong competition for Attack, but they were determined and were able to take the first set, easily winning 25-17. They slipped a little in second set, losing 18-25, but were able to win the match with a tie-breaking score of 15-12. This placed them second in their pool. Next up were the Quarter Finals where Attack met up with the Predators 17U team. This team seemed to give Attack more of a challenge then the older team, but D.A. was still able to beat them two straight, with scores of 25-21 and 25-22, taking them into the Semi Finals. The Semi Final match was against London’s Forest City Green 17U team. FC has historically given Durham Attack their greatest challenge, but Attack was victorious in their first game against them, winning 25-22. Forest City came back stronger in the second game and Attack lost 18-25. The tie-breaker was close and it could have gone either way, but unfortunately, Attack lost 12-15. Durham Attack went into the Bronze Medal match against Leaside 18U, still hoping to bring home a medal. It wasn’t easy, but after another three-game match and scores of 25-22, 23-25, and 15-13, the Durham Attack 17U Girls’ Team won the bronze medal in this 18U tournament. Not bad at all. Anna Aguayo, Jaime Fryer, Ashley Hart, Julie Longman, Olivia Michaud, Nicole Mironov, Rachel Poole, Layton Risto, Callan Rolfe-Hughes, Kristine Yan, Michelle Yu, and Coaches Kevin Hellyer and Mike Slean. ANOTHER GOLD MEDAL WIN FOR DURHAM ATTACK 17U GIRLS! The Durham Attack 17U Girls’ Team had an amazing day on February 25 at the Bugarski Cup Tournament in Kitchener, Ontario. Once again, they brought home yet another GOLD medal, proving that they are definitely one of the best teams in Ontario in their age division. The tournament started, like all others, with Attack coming out strong in Pool Play, winning most games, and finishing first in their pool. In their first match they faced Eclipse West, winning both sets 25 to 18. They followed this up with another strong match against Predators Purple winning 25-17 and 25-18. Durham Attack’s only loss of the day was in the first game against Diamonds, losing 18-25, but they came back to beat them by more in the second set, winning 25-17. With barely a chance to stop for lunch, Attack quickly started their Quarter Final match against DRVC (also from Durham). Although DRVC played a strong first set, they could not quite overcome Durham Attack. Attack won the first set 25-23 and the second set a convincing 25-17. Durham Attack’s Semi-Final match was against South County Bandits. Bandits, although a strong team, were not able to compete with Attack’s amazing serves, passes, sets, blocks and hits. Attack won both sets 25-19 and 25-22. The final match for the GOLD medal was once again against the Diamonds, who were also successful in their matches since pool play. Attack was confident going into the game, knowing that they had already beaten them in pool play, and their confidence paid off with two straight wins scoring 25-20 and 25-23. Another successful tournament and another GOLD medal! The Durham Attack 17U Girls’ Team will be competing in the Ontario Provincial Championships taking place on April 13-15 at Rim Park, Kitchener, Ontario. Good luck to them for continued success! Team: Anna Aguayo, Jaime Fryer, Ashley Hart, Julie Longman, Olivia Michaud, Nicole Mironov, Rachel Poole, Layton Risto, Callan Rolfe-Hughes, Kristine Yan, Michelle Yu, and Coaches Kevin Hellyer and Mike Slean. 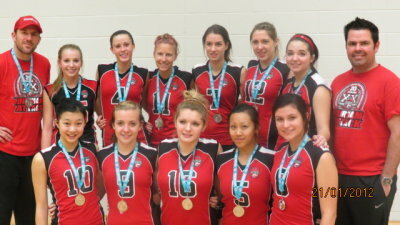 Durham Attack 17U Girls Medal Again! On February 4, Durham Attack’s 17U Girls’ Team travelled to Fanshawe College in London, Ontario for the 17U McGregor Cup tournament. This was their third tournament in their own age group this season, and they were determined to stay at the top of the premier teams in Ontario. Pool Play started with their first match against the Predators Purple (from Kitchener-Waterloo). Durham Attack came out strong the first game and was successful in getting a good lead. The Preds were able to gain ground though, threatening Attack’s chance of winning. Attack held their own, however, and won with a score of 29-27. Durham Attack was able to secure another win in the second game and scored 25 points to their 19. The Ottawa Mavericks were next up in Pool Play and Durham Attack won both games with scores of 25-20 and 25-19. With a first spot finish in Pool Play, Attack was awarded an extra long lunch break and a buy into the Quarter Finals. Once again, Durham Attack was to face the Predators Purple team. Sometimes facing the same team in the finals is a little daunting, even after beating them two games straight. Attack stayed on their game, however, and won both sets 25-16 and 25-20. Durham Attack was off to Semi Finals and ready to play Lakeside (from Oakville). The Attack team was in fine form, and demonstrated some great serving, perfect passing, accurate setting, and powerful hitting. They took both sets easily, winning 25-13 and 25-21. Not having lost a game all day, Durham Attack should have been more than confident going into their last match of the day. They knew, however, that they were, about to face London’s Forest City Green Team in the fight for the Gold Medal (yes, once again). Durham played their best in both sets, but was not able to overtake the talented F.C. team, losing 20-25 and 18-25. Hopefully they will get their chance at the Provincials! Congratulations once again to Durham Attack’s 17U Girls’ Team: Anna Aguayo, Jaime Fryer, Ashley Hart, Julie Longman, Olivia Michaud, Nicole Mironov, Rachel Poole, Layton Risto, Callan Rolfe-Hughes, Kristine Yan, Michelle Yu, and Coaches Kevin Hellyer and Mike Slean.